The three bones that are responsible for the formation of the elbow joint are humerus, radius and ulna. It includes two articulations: (a) humero-ulnar articulation, between the trochlea of the humerus and trochlear notch of the ulna, and (b) humero-radial articulation, between the capitulum of the humerus and the head of radius. The elbow is hinge type of synovial joint where the scope of movement is only in one direction. Ligaments are strong cartilage pieces that act as a connection between the bones. They assist in providing stability to the joints and facilitates the movement. 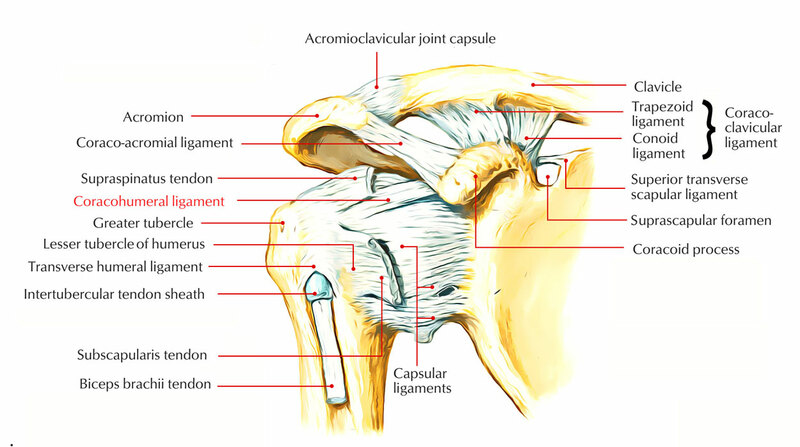 Capsular Ligament is a sac made up of fibers that encloses the joint cavity. The inner surface of the capsule is lined by the synovial membrane. It is triangular in shape, with its apex attached to medial epicondyle of the humerus and base to the coronoid and olecranon processes of ulna. It extends from lateral epicondyle of the humerus to the annular ligament with which it blends. Anteriorly – (a) Brachialis Muscle (b) Median nerve (c) Brachial artery (d) Tendon of Biceps Brachii. Posterior – (a) Tendon of triceps (b) Anconeus. Medially – (a) Flexor carpi ulnaris, (b) Ulnar nerve (posteromedially) (c) Common flexor origin of the muscles of forearm (anteromedially). Laterally – (a) Spinator (b) Common extensor origin of muscles of forearm muscles (c) Extensor carpi radialis brevis. Subtendinous olecranon bursa lies between triceps tendon and upper surface of the olecranon process. Subcutaneous olecranon bursa is comparatively a larger bursa that lies between skin and subcutaneous triangular area on the posterior surface of the olecranon. Bicipitoradial bursa is a small bursa separating biceps tendon from smooth anterior part of the radial tuberosity. A small bursa separating the biceps tendon from the oblique cord. The blood supply of elbow joints is by arterial anastomosis around the elbow formed by the branches of brachial, radial and ulnar arteries. If your elbow is injured or you’re experiencing pain in the elbow, there are several measures that can be taken to start the treatment right away. First, go and consult your doctor to eliminate any serious injury to your elbow’s ligaments or bones. After an elbow injury, you can opt for the RICE method to help control the inflammation process. The RICE stands for rest, ice, compression and elevation. Give good rest to your elbow, apply an ice pack, and elevate your arm to minimize the swelling.